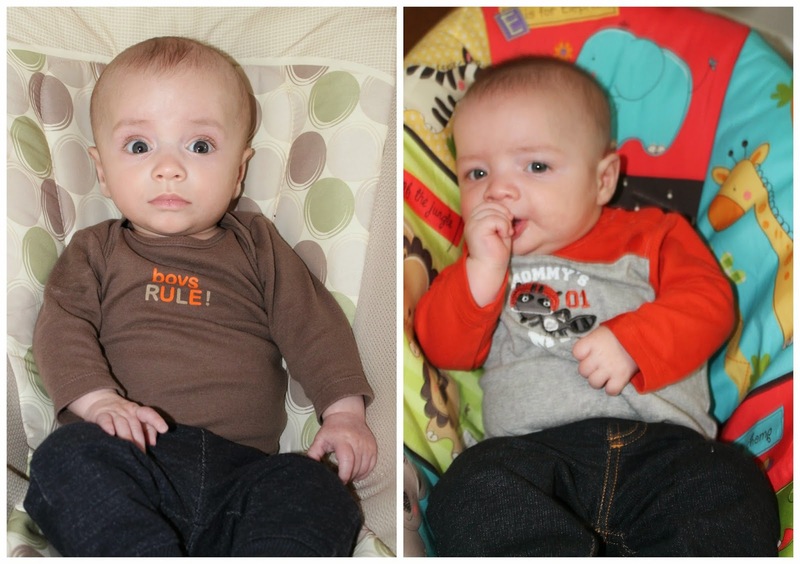 Our "Day in the Life" series continues with Laura's four-month-old twins! 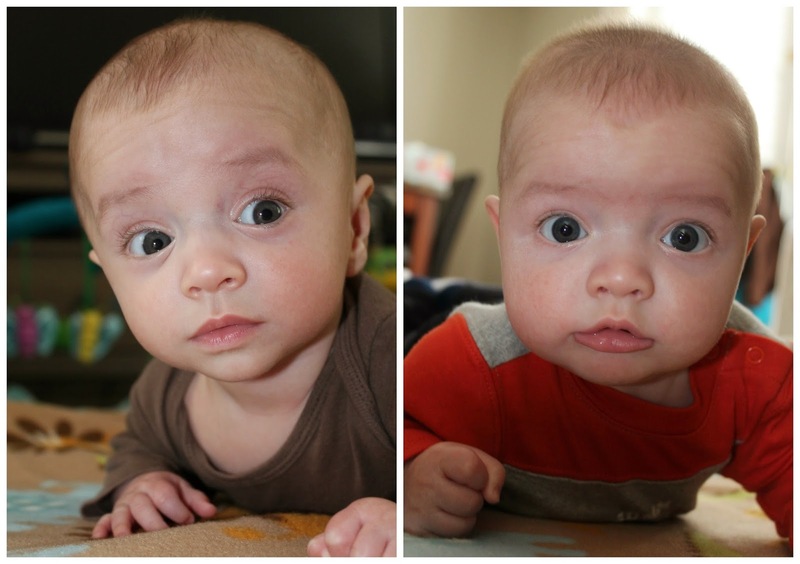 Here’s a day in the life of our four-month-old twin boys – Patrick + Cameron. They were born at 33 weeks, 5 days and spent a little over 2 weeks in the NICU with no major complications, just needed the extra time to mature. Because they were born early, our pediatrician has us fortify breast milk with high-calorie premature formula (1/4 tsp to 45 mL) so the boys grow big and strong. And after most breastfeeding sessions, we give them a mini bottle (about 2 ounces) to make sure they are getting enough to eat. I also pump throughout the day after the boys nurse. They get mostly fortified breast milk with an occasional bottle of formula when I haven’t pumped enough. I recently returned to work part-time three days a week so I highlighted one of my weekdays home with the little guys while my husband, Nate, is at work. 2:25 AM Cameron starts crying. Rather than being in the crib in his bedroom, he’s in the Rock N Play next to my bedside. We’ve had a bit of a sleep regression/growth spurt going on with him lately so he sometimes stays close by for a quick nursing session in the middle of the night. But this is a feeding time for both guys so Nate grabs Cameron and changes him while I grab the bottles out of the mini fridge and place them in hot water to warm them up. I then go get Patrick out of his crib in their bedroom, wake him up, and change him too. 2:50 AM Nate puts both boys back in their sleep sacks and back to bed in their cribs. 3 AM I put my pumped milk and pump parts in the mini fridge and climb back into bed. 6:45 AM I get up and go to the boys’ room. Patrick has been “talking” in bed for a little while and Cameron just started to stir. I get them both up, changed, and dressed for the day. 7:05 AM I bring the boys into our bedroom and tandem breastfeed them. Nate leaves for work and kisses us all goodbye. 7:30 AM We come downstairs for some playtime. I make myself some breakfast and pump. 8:15 AM Give Patrick another diaper change. Boys are yawning and rubbing their eyes so we head upstairs for naps. 8:20 AM Sit upstairs in our glider and rock the boys for a little. Patrick is quite content but Cameron not so much. Put Patrick down in the crib awake but drowsy. Then walk a crying Cameron around for a little bit until he gets calm and drowsy and I put him down in his crib too. 8:45 AM Both boys are asleep. Take advantage of the time and put away clean laundry, wash bottles and pump parts, and put together mini bottles with vitamins for the following feeding. 9:35 AM Boys wake up. I come upstairs and change their diapers and bring them downstairs. 9:47 AM I nurse both boys and then give their mini bottles. 10:20 AM It’s play time again. They do a little tummy time and show off their newest trick – rolling over! I pump again too. 11:00 AM Change Patrick’s dirty diaper. 11:15 Load up the boys in the car to run errands. We head to Target for a few things and then swing by our grocery store to pick up our online order. I order groceries online and it’s amazing to just pull up front and have them ready and loaded in your car for you! 12:40 PM We return home from our errands and I unload sleeping boys and put away groceries. I make and eat lunch while they’re still snoozing. 1:15 PM Change diapers, nurse both, and give mini bottles. 2 PM Put the boys down to play on their activity mats and I pump again. The boys show off with more tummy time. 2:40 PM I wash bottles and pump parts. 2:50 PM It’s a beautiful day so I put the boys in the double stroller and we head out for a long walk. 3:50 PM We return home and I put Patrick in the swing and Cameron in the Rock N Play to hang out for a little bit. Have a little time before the next feeding so I prep dinner by marinating shrimp and read some blogs on my phone. 4:20 PM Change diapers, nurse both, and give mini bottles. 5:05 PM Play time again and I pump. 5:45 PM The “witching hour” begins. [Thank you all SO much for all your tips and suggestions you shared on Instagram!] I put Cameron in the infant carrier and we walk around while Patrick hangs out in the swing. 6:15 PM Cameron and I pack Nate’s lunch for work tomorrow. 6:30 PM Patrick starts fussing in the swing so I pick him up and walk around with both for a few minutes. 6:35 PM We head upstairs, change diapers, and put on our pajamas. 6:50 PM This time we do feedings opposite where we give a larger bottle (5 ounces) with their vitamins first and then I nurse after as a comfort/to top them off for the night. We also read a story (“Goodnight Stinky Face”) and say our prayers. Our other bedtime ritual is a bath but we did one last night so tonight is a night off! 7:30 PM Boys are in bed and I start dinner. 7:45 PM Nate comes home and immediately starts helping around the house washing bottles, taking out the recycling, and puts together the bottle for the middle of the night feeding. 9:00 PM Head upstairs to get ready for bed and iron shirt for work tomorrow. 9:30 PM I get set up in bed with twin nursing pillow and Nate slips into the boys’ room and brings me the sleeping boys for an early “dream feed.” We just started doing this in an effort for us to get a longer stretch of sleep rather than waiting for boys to wake around 11 PM or midnight. I nurse both and Nate puts them back to sleep in their cribs. 10:00 PM We’re all in bed! 11:20 PM Cameron wakes up. Seems like he’s getting up at least once extra every night to nurse – growing boy! Nurse him and then we all go back to bed until next wake up call. - Snap n go stroller – this makes running errands SO easy. I bought ours used from our local moms of multiples group. - Amazon Mom – also saves us tons of time and money by subscribing to essentials like diapers and wipes. And getting free 2-day shipping is pretty incredible! Don't forget to submit your 15-week bump picture! 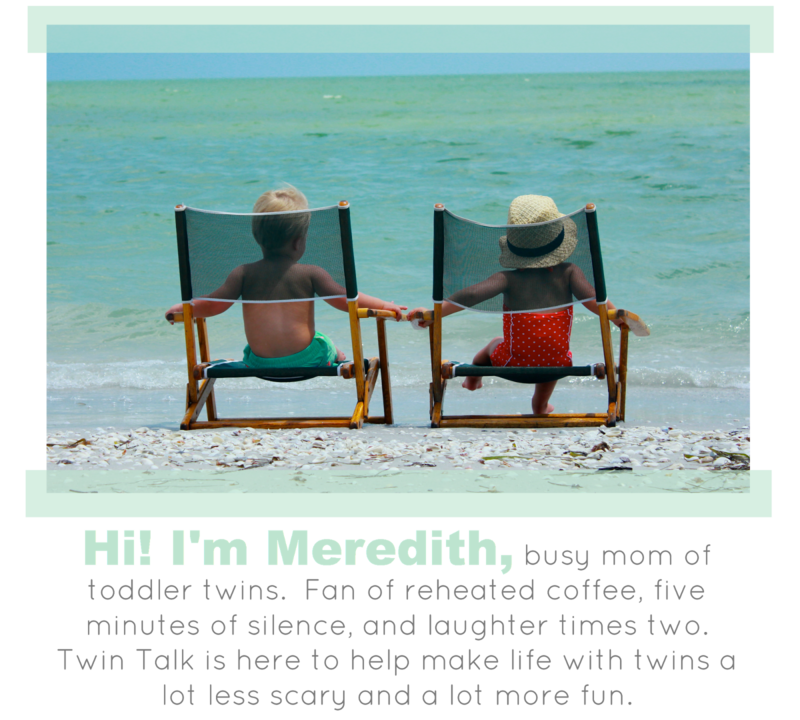 Email your picture, name, and the twins' birthday (or due date) to twintalkblog@gmail.com. Ordering groceries online sounds amazing! !